Chester, formerly known as Black River, grew up at the crossing of Indian trails which became the "Great Roads" across the state of New Jersey. The history of this settlement at the crossroads can logically be divided into three periods: colonial, village settlement, and mining. The colonial period (1719-1799) saw the breaking up of the large land grants into manageable farms. The earliest settlers came primarily from Long Island in the 1730s. For the most part they were farmers, although a few enterprising individuals soon established iron forges and distilleries. They established taverns which were the local meeting places and stage stops, and churches (The Presbyterian Church on Pleasant Hill Road and the Congregational Church near its present site) which fostered a sense of community spirit. Schools were first established in private homes led to organized public and private education. Meanwhile, settlers were moving into the area from Hunterdon and Somerset Counties. The year 1799 marked the incorporation of Chester as a township of Morris County. By 1806 the Washington Turnpike (Route 24) was chartered, bringing with it rapid building development in the center of the community. New houses were built, existing homes enlarged, churches rebuilt, and a three-story brick hotel rose to dominate the center of the town. Schools and a post office were established. 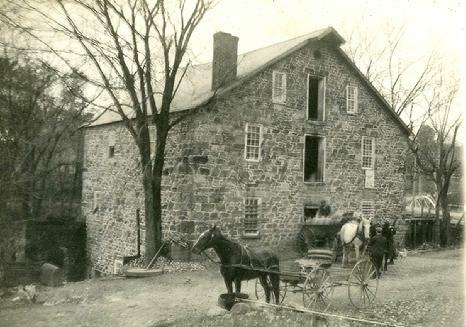 Farming was still the major occupation of Chester, but the needs of the burgeoning community soon saw the appearance of the miller, the tanner, the blacksmith, the cabinetmaker, and, of course, the distiller of "Jersey Lightning." This whole village settlement period, which is essentially the first half of the nineteenth century, was characterized by an increasing awareness of community responsibility in local and county government. The mining period (1850-1899) brought great prosperity and an influx of miners and furnace and casting operators. Originally, charcoal-fired furnaces had processed the local iron ore...but the wood supply was soon depleted. The Bessemer process, which relied on coal, was used in later operations such as the Taylor Furnace on Furnace Road. This coal was brought in via the Morris Canal and connecting railroads. Company houses for the miners, elegant Victorian homes for the owners, and new church buildings, all reflect the prosperity of the period. Political maturity was reached when two of Chester's sons were sent to the State Legislature. With the opening of the Mesabi Iron Range in Minnesota, the local mining industry declined, and Chester began its quiet years at about the beginning of the twentieth century.